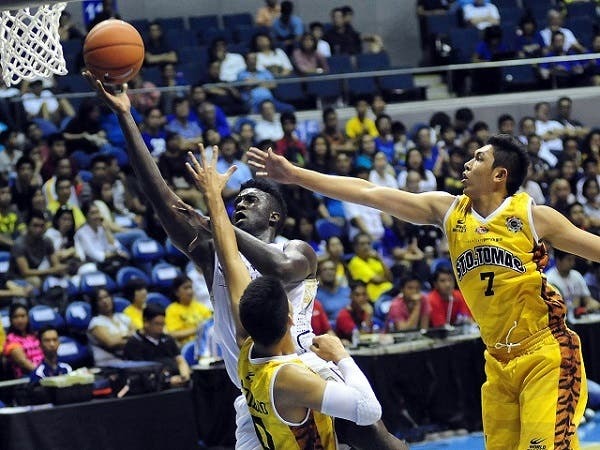 The tide has finally turned for the winless National University (NU) Bulldogs, but their battle against the University of Santo Tomas (UST) Growling Tigers did more than just break their no-win streak. It was a close and heated battle between the Bulldogs and the Tigers, but it was a last second fadeaway jumper by NU’s Alfred Aroga that sealed the Bulldogs’ slim win at 55-54, finally breaking their 0-3 record in the start of the season. The Bulldogs win came as no easy task. With just a little over 2 minutes left before the end of the third quarter, the Tigers wasted no time scoring hoops to overtake a 41-36 deficit, leaving the Bulldogs scoreless until the end of the quarter which ended at 41-43 in favor of the Growling Tigers. Picking up from the third quarter, the Tigers continued their scoring streak at the opening of the final quarter, initiating a massive 15-0 run that furthered the score gap to a 7-point lead. But the Bulldogs, led by Aroga –named last season’s MVP player– responded with a 12 point attack to grab the lead again at 53-52, with only a minute left before the end of the game. It was a long fight for possession until UST’s Ed Daquioag pulled off a lay-up to push the Tigers into the lead, 53-54 with 25 second left on the clock. With only 14.7 seconds left, Aroga worked his final magic: a fadeaway shot from behind the three-point line. With a final chance at possession, the unbeaten Tigers failed to convert, sealing the game at a final score of 55-54 to the Defending champion. NU’s Aroga scored a total of 19 points throughout the game, the only player to score double digits for the team. He was followed by JJ Alejandro with 9 points and Nico Abatayo with 8 points. NU now has 1 win and 3 losses, while UST has 3 wins and 1 lose, incurring their first lost at the hands of the aggressive Bulldogs. The NU Bulldogs will be facing Adamson next on Wednesday, September 23. What do you think of NU’s first win? Were you expecting it? We’d love to hear your comments below! DOTA: Tickets for DOTA 2 Manila Major go as low as 50 pesos!